I have a lot of trouble getting to sleep. Either my neck feels cramped or is not being supported enough! I have 5 pillows on my bed (remember I am single) and it takes a while to figure out which one to use--or double up with. I absolutely love that you can adjust this pillow. Of course I'd have to hide the extra filling because a certain cat I know and love would love scattering it all over the place! There are times I need one or two of the pillows to elevate my legs---this one fully stuffed would do the trick! 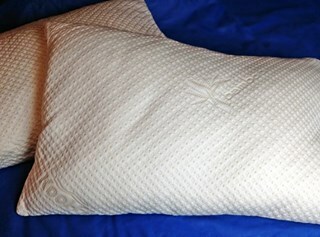 The Snuggle-Pedic Adjustable Kool-Flow pillow is perfect for side, back, stomach, and pregnant sleepers! The Snuggle-Pedic pillow conforms to your neck, giving you proper orthopedic support. It also adjusts to each position you sleep in, while allowing you to sleep cooler. Relief-Mart™ Inc. was created with the intention of helping people around the world through products which enable people to take charge of their health today. In these modern stressful times, the value of good health cannot be overstated. Whether you are in pain or just want to improve your overall health, Relief-Mart™ offers you the highest quality home health products customized to your individual needs. Their goal is to give you the best available resources to take charge of your health today. 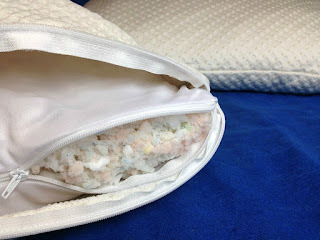 Only Snuggle-Pedic uses a proprietary mix of our very special hypo-allergenic and extremely low V.O.C. Biogreen® memory foam and CertiPur-U.S. certified foam. The very small pieces are extremely soft and fluffy and make their pillow lighter and more resilient than the usual shredded memory foam pillows found on the market. In addition, the Snuggle-Pedic Kool-Flow Pillow is also hypoallergenic and dust mite resistant. The Snuggle-Pedic is simply brilliant in design! You can adjust the “stuffing” for your level of thickness and comfort by simply unzipping it. It also features a removable bamboo cover that is machine washable. 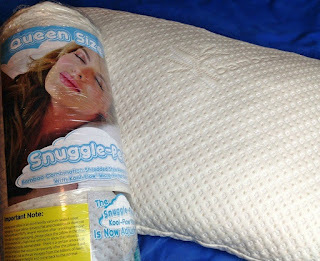 Be sure and read what Diane thought about the Snuggle-Pedic Kool-Flow Pillow in her full review here. Snuggle-Pedic Queen Size Pillow with Cover! Giveaway ends 9/16/17 at 11:59 pm ET! Open to US residents 18+ and older. I get hot with my current pillow and i'm always having to reposition it. I just get too hot with my current pillow and also can't find a comfortable place to sleep on it. I would love to win this for my daughter. She struggles with finding a good pillow to support her head and neck. Thanks. My neck hurts in the am. I like a pillow that does not get too flat in the middle of the night. I have not slept a full night in weeks. And I always wake up with a headache. I squish and smash the pillow but nothing works. The pillows we have right now are too firm and uncomfortable. I have had neck problems. The pillows I'm currently using are terrible. I'm a side sleeper so i need my head to be elevated. I can't sleep on a really flat pillow. I struggle with finding the right type of pillow. I feel like I'm suffocating with a poufy pillow. having to adjust it several times a night!! I get a sore neck because my pillows right now are too flat. My pillow makes me overheat at night!